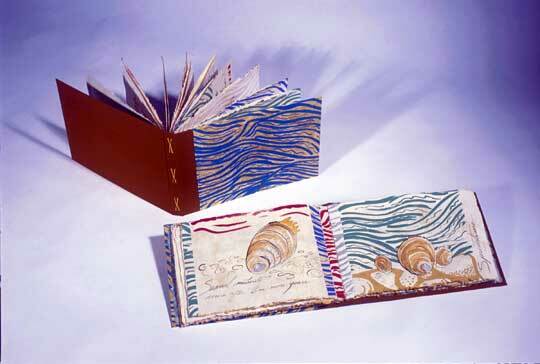 Maine Craft Association: "Rebecca Goodale has been creating innovative and sublimely-made artist’s books for many years and frequently does collaborative work with other artists as well as public art installations. 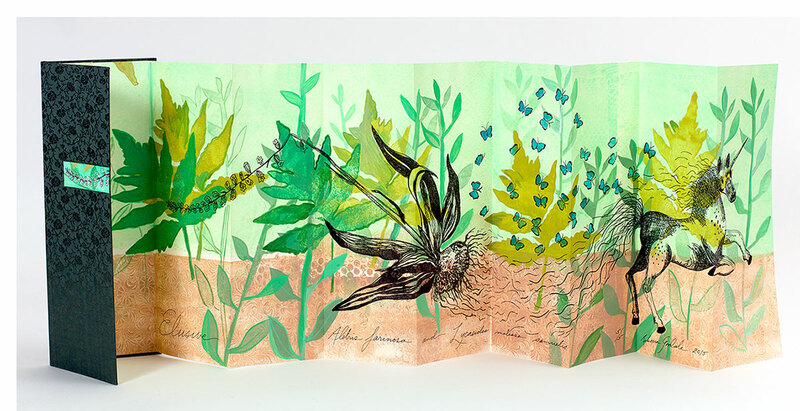 … Goodale’s current body of work consists of a series of artist’s books about the more than 200 plants and nearly 50 animals currently listed as threatened or endangered by the State of Maine. 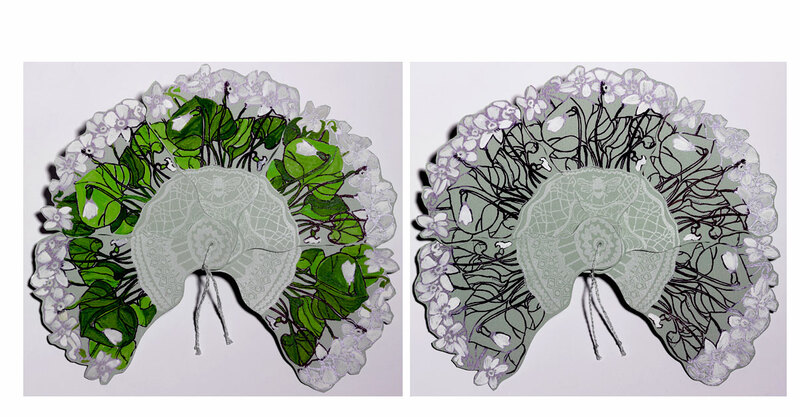 Her intention is not to become a scientific illustrator; instead, Goodale wants to inspire sensitivity for these rare flora and fauna by using her background in book arts and textile design to interpret color, pattern, rhythm, and transition." Freeport, Maine: Rebecca Goodale, 2017. Edition of 7. 6.625 x 4.125 x 1.5"; 5 panels, double sided. Jacob's ladder structure. Silkscreen printed on Japanese paper and Tyvek. Signed and numbered by the artist. Cloth bound covers and slipcase. Rebecca Goodale: "A Jacob's Ladder structure that undulates to reveal four short poems and illustrations of beets, daisies, fox gloves, and forget-me-nots." Portland, Maine: Rebecca Goodale, 2017. Edition of 6 + 2 AP. 10 x 26" closed, extends to 10 x 39 x 39". Silkscreen prints and dry point prints. Text letterpress printed at Ascensius Press in Bar Mills. Interlocking binding in hinged cover. Bound in green book cloth with paper title label. Signed by the poet and the artists. Numbered. A collaboration between Rebecca Goodale and Stephen Burt with a poem by Cathleen Miller. The prints show the growth habit of the common comfrey plant. The book is read standing and open. 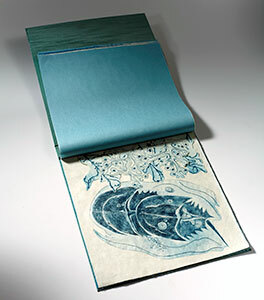 Rebecca Goodale: "In 2016 Stephen Burt and Rebecca Goodale decided to create an artist's book together using serigraphy and intaglio for the pages. The imagery was inspired by the common comfrey plant and a poem by Cathleen Miller. They worked collaboratively cutting stencils, and engraving the plates — passing them back and forth until together they decided the screens and plates were ready to print. 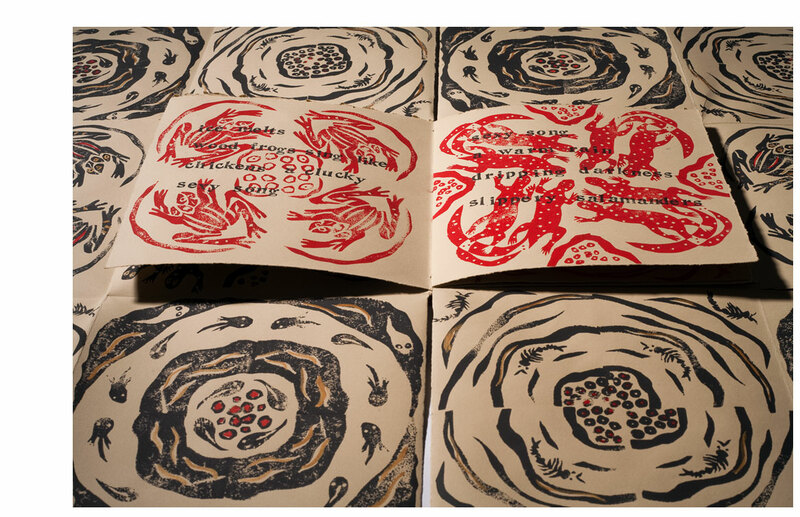 The prints were made in Rebecca's Portland Studio and at Peregrine Press where Stephen is a member." Portland, Maine: Rebecca Goodale, 2016. Edition of 3. 10.5 x 20" orange fluorescent cloth box containing triptych and 3 envelopes of paper cutouts. Silk screen. Pastepaper. Stencils. Hand coloring. Fluorescent inks. Signed and numbered by the artist. Rebecca Goodale: "Large clothbound box with cloth bound accordion listing many nuclear power plant accidents since 1952 to the present. Marking the thirty year anniversary of the disaster at Chernobyl, a 25th anniversary of an accident at Maine Yankee power plant, and the five year anniversary of the accident at Fukushima. "This fold out paper village includes humans in gas masks, blue horses, an apple tree, an abandoned yellow ferris wheel, buildings, a fence, a beaver, and many other creatures." 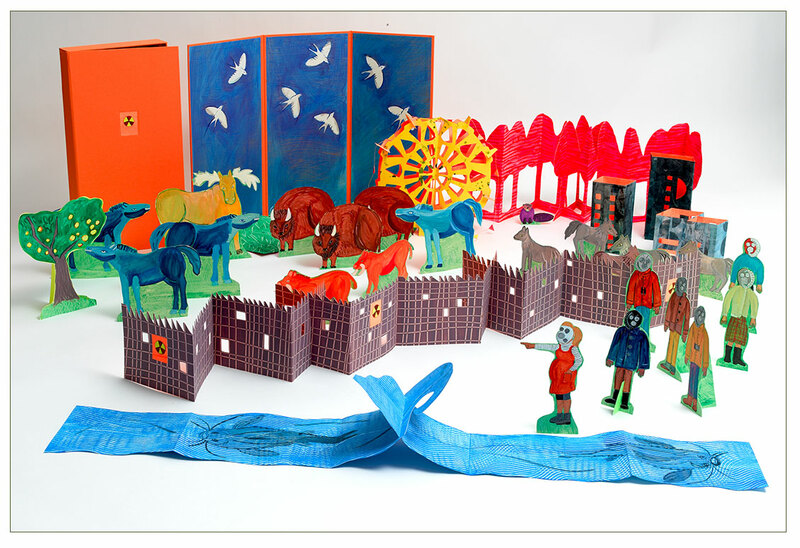 A construct-it-yourself diorama to remind us of the perils of nuclear plant accidents. Portland, Maine: Rebecca Goodale, 2016. Edition of 4. 6 x 8"; 20 pages including free end pages. Dry points and screen printed papers. 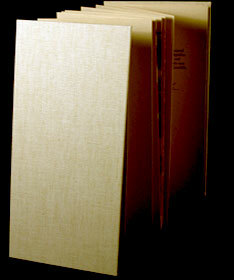 Three section book with a hollow-back cloth binding. Black and white sewing pattern on spine. 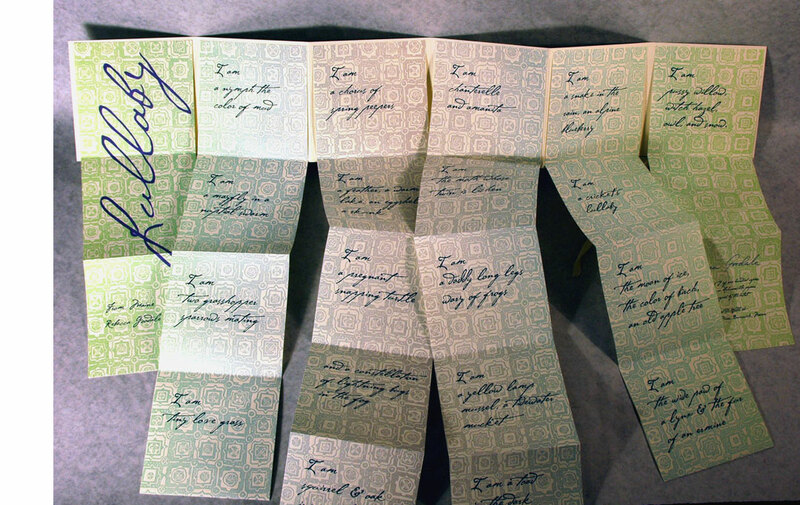 Signed, dated, and numbered by the artist. 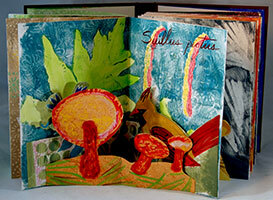 Rebecca Goodale documents the flora of Maine through artists' books. Sanguinaria canadensis is commonly known as bloodroot. "Bloodroot was a traditional medicine used by many American Indian tribes to treat fever and rheumatism. Other traditional uses were for treatment of ulcers, ringworm, and skin infections. It was, and still is, used to produce natural red, orange, and pink dyes. Currently, bloodroot is being studied for use as an anti-cancer agent, particularly for the treatment of skin cancer, and as a dissolving agent for skin growths such as warts." Portland, Maine: Rebecca Goodale, 2015. Open Edition. 12.5 x 9"; 24 leaves. Printed in full color. Saddle stich (staple) bound in heavy illustrated wraps. Signed and numbered by the artists. 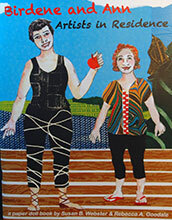 Rebecca Goodale: "Our first collaboration with each other has produced an amusing look at two women in Residence at Haystack Mountain School of Crafts, Deer Isle, ME. 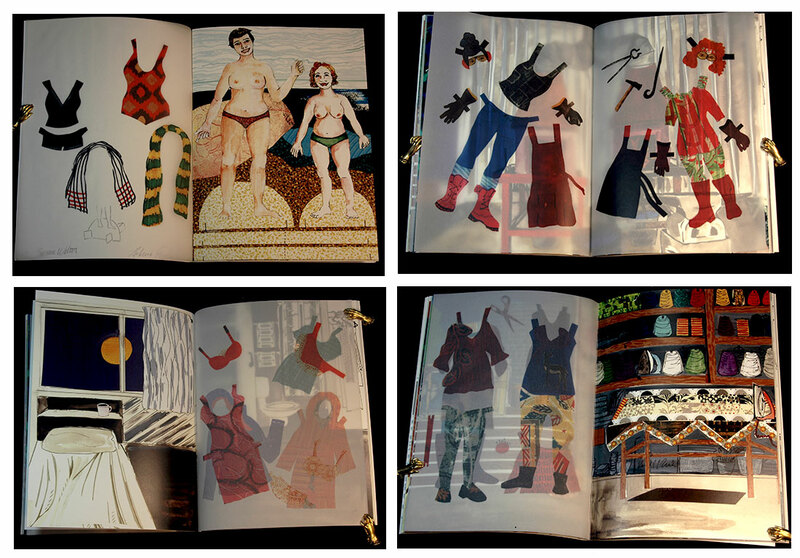 You can visit the deck, the beach, the graphics studio, the wood shop, the fibers studio, the hot shop, and Cabin D. There are 12 pages of clothes and accessories and two dolls to cut out, as well as 11 pages of our interpretations of some the interior and exterior spaces at Haystack." Portland, Maine: Rebecca Goodale, 2015. Edition of 5. 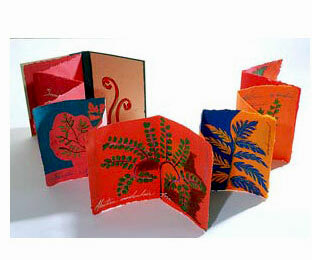 Set of three accordion books in a clamshell box (11 x 11 x 2"). Hand-colored dry point etchings, with added paste paper pennants hung on a line strung between pages. 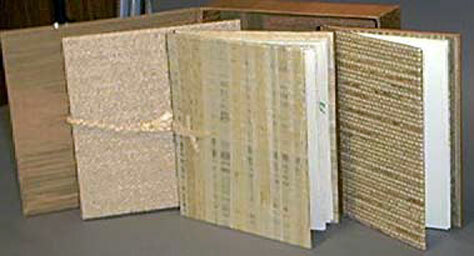 Each book and box bound in different color cloth. Signed by the artists. 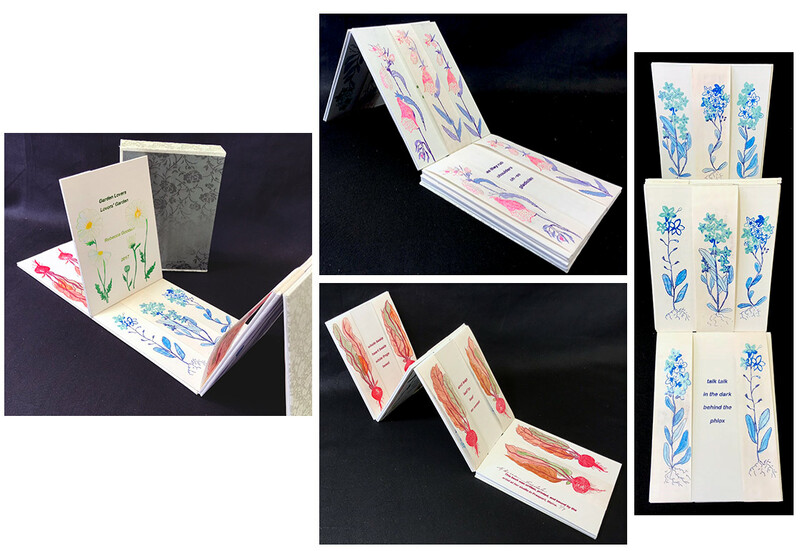 Rebecca Goodale: "This set of three books traveled between the artists' studios at Bowdoin College, Freeport, and Portland, Maine for printing, hand coloring and binding. 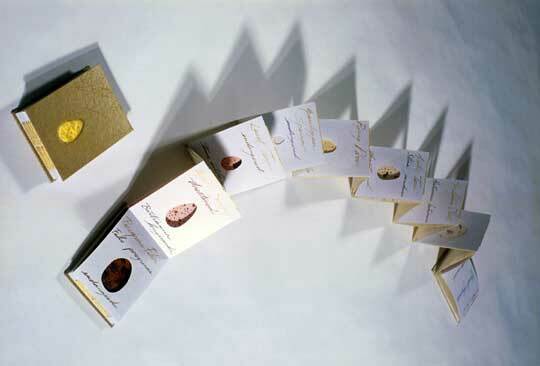 The clamshell boxes were begun in Eaton, NH at the studio of Marnie Cobbs and finished in Freeport. "Goodale and Scanga worked together on the plates, often sitting close beside each other while making marks on the same plate. The narrative follows the three friends from 'Two or Three Friends' their previous book project. "During the two years it took to conceive of and finish this project one artist became a mother and the other became motherless. The baby panda in the narrative is a new and necessary character, one that buoys the artists along to consider the future and the possibility of the next collaboration." Portland, Maine: Rebecca Goodale, 2014. Edition of 25. 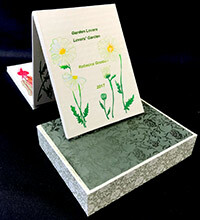 6.5 x 9.5"; 5 leaves + 3 panel foldout page. Pamphlet binding. 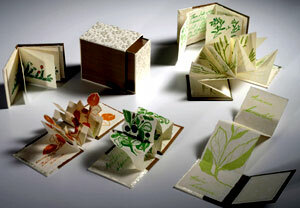 Handmade papers by Katie MacGregor, type design and printing by Scott Vile at Ascensius Press. Watermark design, book design, and binding by Rebecca Goodale. Signed and numbered by the writer and artist. Rebecca Goodale: "I have wanted to make this book for several years. Brendan's poem spoke to me about writer's block or seeing something and then it is gone. I wanted to make a coyote as a watermark, and now here it is." Portland, Maine: Rebecca Goodale, 2013. Numbered open edition. 11.25 x 9.25"; 24 pages. Print on demand. Single-section paperback book. Handsewn pamphlet stitched binding. Signed and numbered by the artist. A bit of fanciful autobiography accompanied by Goodale's charming illustrations. Colophon: "The artist conceived this book as a work of autobiographical science fiction coupled with ink drawings and collage on paper." Introduction: "They are all the same age, 26, with an education similar to mine. They are all in excellent health. They know me better than anyone else. I recognize them as younger, less experienced versions of myself. They all have my name." Portland, Maine: Rebecca Goodale, 2013. One-of-a-Kind. 10.75 x 10.75" closed. 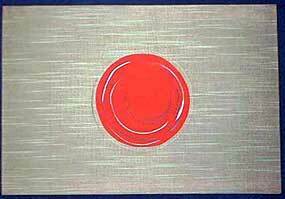 Flag book. Roller-printed paper. Cloth bound. Signed and dated by the artist. "Seeds" contained in a small ziplock bag. 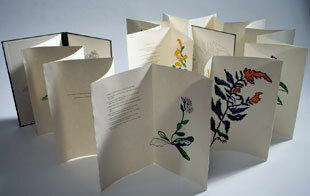 Rebecca Goodale: "This book was created especially for an exhibition on pollination. After years of studying grasses and their various ways of propagating,-here I have emphasized wind pollination with the movement inherent in a flag book." Portland, Maine: Rebecca Goodale, 2010. Edition of 5. 10 x 9.5" closed, opens to 38 x 38". 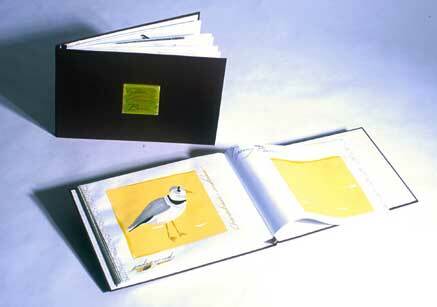 Banner book with handprinted collograph. Boards bound in red silk with raised letters. Ribbons on board allow image to be hung. No text for this silenced species. The ghostly image is a too-apt reminder of the cost of extinction. Rebecca Goodale: "Dodo came from a piece of persuasive writing that I am working on, a piece about extinction and memory. I was fascinated to find out that the dodo disappeared 100 years before the appearance of the dodo in Alice in Wonderland. Alice meets the dodo in a pool of her own tears and the encounter brought many readers to a belated interest in the bird, no doubt do to the power of the narrative and/or a good illustration. I have drawn dodo skeletons at NY Natural History Museum and at Harvard. I have also drawn from a 3D scientific model at Harvard. There is very little left of the dodo, and I believe that this famous extinction does link somehow to my own body of work. The image in my dodo book is roughly life size." Goodale's exhibit of books about endangered plants and animals has toured the US beginning at the University of New England's Westbrook College Campus in Portland. These books are from that project. 17 x 6.5" closed, opens to 60". Accordion extending from back pastedown foreedge. Hand-colored lithographs and gelatin plate prints. Bound in cloth-covered boards. Signed, numbered, and dated by the artist. Rebecca Goodale: "In this narrative a unicorn is running away with two of Maine's extirpated species: Lycaeides melissa samulelis ( Karner Blue) a small blue butterfly, which after a long absence has recently been sighted in southwestern Maine and Aletris farinosa (unicorn root) a plant that has not been seen here for over a hundred years." Portland, Maine: Rebecca Goodale, 2008. Edition of 100. 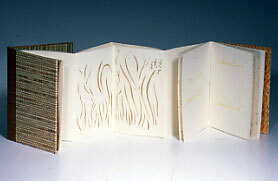 4.75 x 4.75" closed; six vertical-fold pages arranged in an accordion-and-banner structure. Printed on Hahnemühle papers by David P. Wall at The Applecart Press. Cotton ribbon closure. 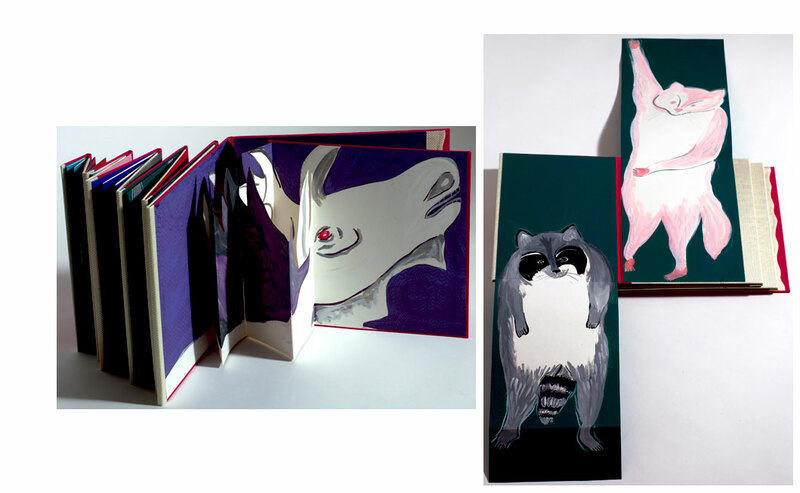 Goodale's primary body of work is a series of artist's books and prints about the plants and animals currently listed as threatened or endangered by the State of Maine. Rebecca Goodale: "I wrote the poem after Wes McNair challenged me to write my T&E [Threatened & Endangered] project into a poem." Portland, Maine: Rebecca Goodale, 2003. Edition of 10. 10.5 x 9 x 4.25" Set of three rotating rings. Each ring in its own box. Rings are hand colored silkscreen prints with collage. Goodale uses different structures and presentations to make points about Maine's threatened and endangered species. In this creation she accompanies images with sound. Each ring is a flexagon which can be twisted and at the same time make noise. The sounds grow fainter as the species decline in number. Endangered makes the most noise with the black racer, ringed boghaunter, roseate, least and black terns as well as the tall white violet. The Extirpated ring sound is fainter with images of the walrus, grey wolf, wolverine, and caribou. When one tries to twist sound from Extinct there is ominous silence as the rotating ring displays pigeon, great auk, sea mink, and Labrador duck. Portland, Maine: Rebecca Goodale, 2014. Edition of 8. 7.5 x 7"; hybrid structure of 13 flag pages plus an 8-page pamphlet sewn into on fold. Accordion structure extending from back pastedown. 13 flag pages have 3 asymmetric flags per page. Silkscreen and hand painting. Printed on [Katie] MacGregor Handmade Paper. Letterpress text designed and printed by Scott Vile of Ascenius Press. Bound in cloth-covered boards. Numbered. Signed by artist and poet. Another in Goodale's Threatened and Endangered series. Rebecca Goodale's heart-shaped flags are accompanied by Miller's poem. Wild ginger, a low perennial with two heart-shaped leaves, is listed in Maine's threatened flora category. Cathleen Miller: "I am a poet, herbalist, artist, dreamer, gardener, systems-thinker, and special collections librarian living in Portland, Maine. I am an observer, in poems and in life. I write about connection, desire, place, the natural world, and bodies in space." Portland, Maine: Rebecca Goodale, 2014. Edition of 15. 8.5 x 6.5" closed; 5 leaves. 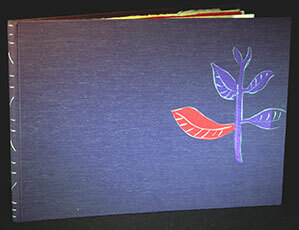 Screen printed on a Gocco printer, hand-colored, and hand-cut. Fan book structure with tie closure at the handle/spine. In stiff green paper open-ended envelope. Signed and numbered by the artist. 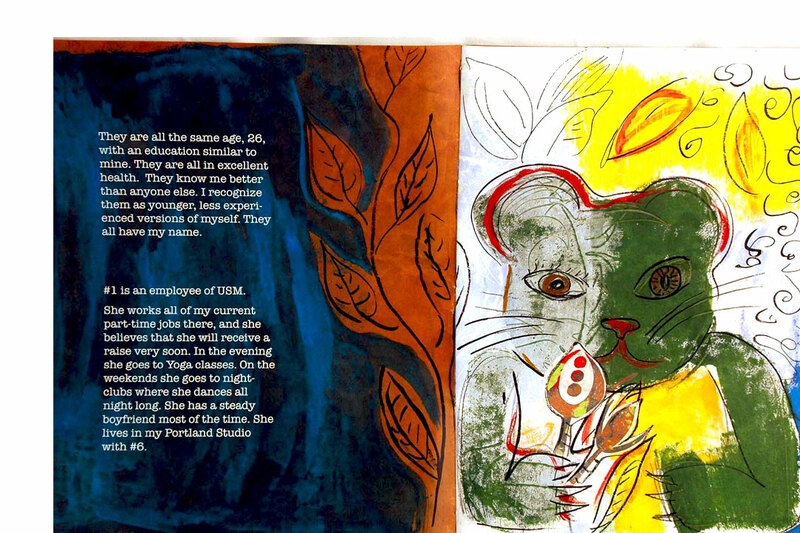 Each book varies slightly because of the handcoloring. Portland, Maine: Rebecca Goodale, 2012. Edition of 5. 5.5 x 5.5 x 3". 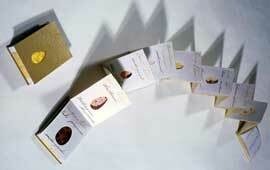 Paper ribbon of MacGregor handmade papers. Paste papers, hand coloring, and silkscreen prints. In drop hinge cloth-covered clamshell box. Title handpainted on lid in Latin. Title, number, edition, year, and signature on pastepaper lining lid interior. Another work in Rebecca Goodale's Threatened & Endangered series, which presents the threatened and endangered flora and fauna of Maine. In Maine the small water lily is considered to be in the threatened status. Here the delicate lily pads and one bloom are attached to paper ribbon anchored to the box's bottom. 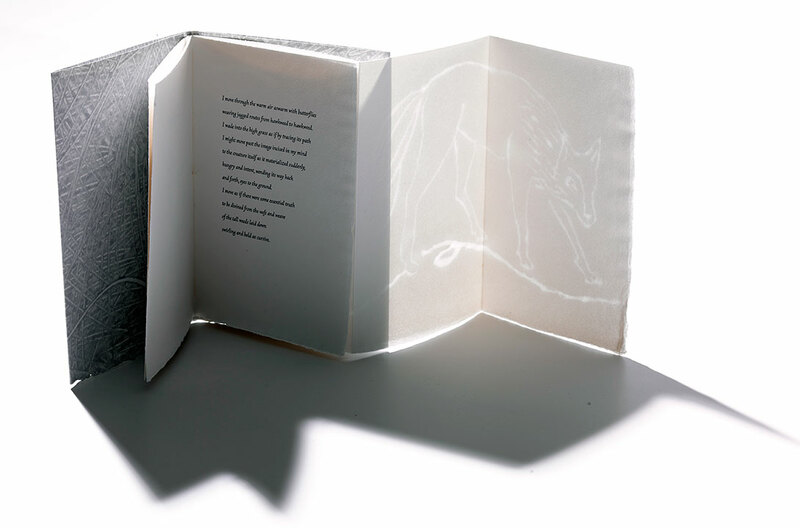 Nicholas Schroeder, Rebecca Goodale's Artists Books at UNE: "For those not solely concerned with Goodale's unorthodox field guide of endangered species, her most arresting ideas are to be discovered in the limitless ways in which she conceives of a book. 'Pygmy Pond Lily,' … exploits a jack-in-the-box motif to an almost nightmarish degree, its fronds (made from paste paper and marbling on Tyvek silkscreen prints) creep in every direction." 8.375 x 27.25" closed, extends to 82". Cutouts and pop-up structure. Handcolored silkscreen prints. Bound in cloth with ribbon tie closures. Title tipped on cover. Signed and numbered by the artist. 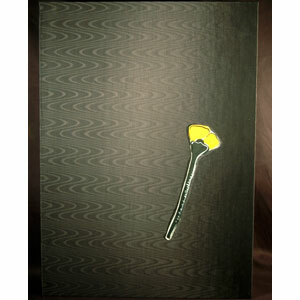 By using the top blue loop (one of the ribbon tie closures), the book can be hung vertically for a cascading display. Clematis continues Goodale's Threatened and Endangered series in a broad sense. Clematis has been classified as a rare plant by the state of Maine. Their first two classifications for plants are those that are imperiled, which are the plants that Goodale usually includes in her series. The rare classification indicates the lack of sightings in Maine (20-100 occurrences). 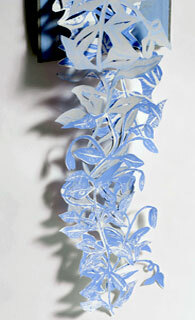 Rebecca Goodale: "My newest book is a tall, cascading book representing the genus Clematis. I drew from two plants, one was Maine's rare Clematis occidentalis. The other was Clematis alpina, which I drew while visiting Montana in June 2010. In both species the blossoms are the color of the sky and look as flecks of the sky are present in the dense shadows of the undergrowth." Portland, Maine: Rebecca Goodale, 2006. Edition of 10. 5.5 x 15.5" closed, extends to 55". Silkscreen printed using a screen with wax resist. 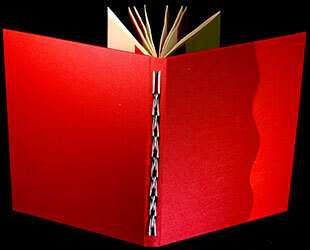 Interlocking accordion book bound into a flat backed, maroon cloth covered case. 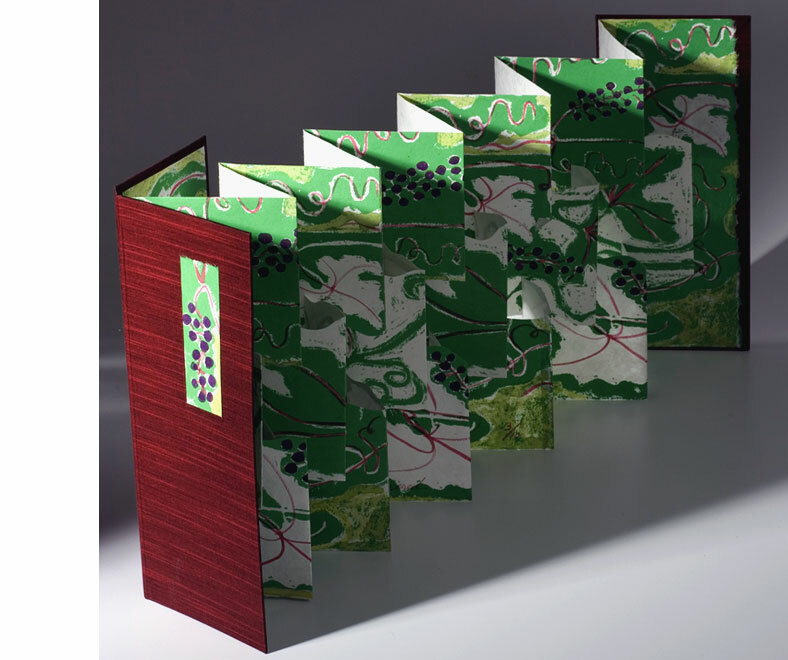 Another in Goodale's Threatened and Endangered series, a book of a flowing tangle of grapes. Portland, Maine: Rebecca Goodale, 2006. Edition of 4. 5.5 x 15.5" closed, extends to 55". Silk-screen (black-and-white with some gray). Interlocking accordion book bound into a flat backed, black-and-brown weave cloth covered case. 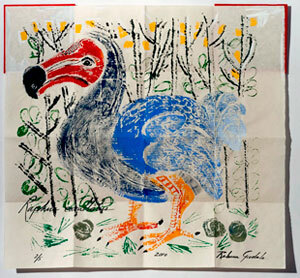 Another in Goodale’s Threatened and Endangered Series. This black-and-white rendition of Summer Grape is the original version. Goodale used this as the prototype for the colored version, later published in an edition of 10. Rebecca Goodale: "I used wax crayons directly on the mesh of the silkscreen to create the matrix. It has an almost batik or woodblock-like texture." Portland, Maine: Rebecca Goodale, 2005. 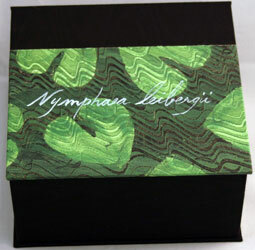 Set of three books in a 9 x 9" cloth covered box. Each book with the same edition number. Three books from Goodale's Threatened and Endangered Species make up this set: Five Maine Rushes, Fifteen Maine Grasses, Cyperaceae. 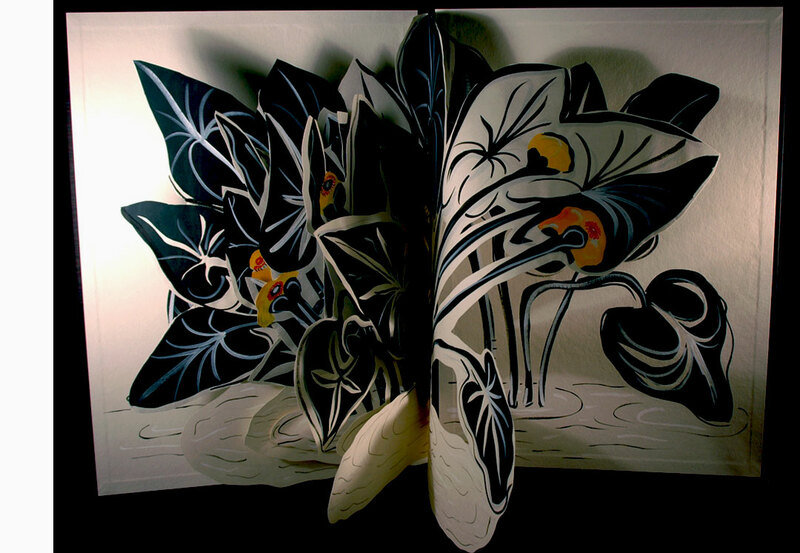 Rushes is an accordion with ink on paper with cutouts. 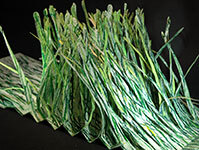 Grasses uses a compound binding with mixed media prints. 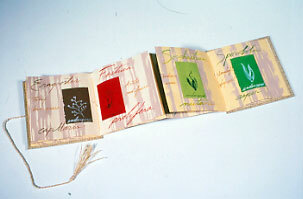 Cyperaceae consists of hand colored gelatin prints in an accordion book. Portland, Maine: Rebecca Goodale, 2004. Edition of 10. 6 x 8.5" closed. 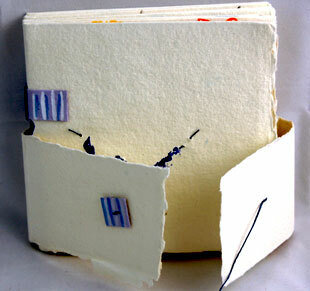 Accordion book construction with two stitched sections. Ink on paper with cutouts. 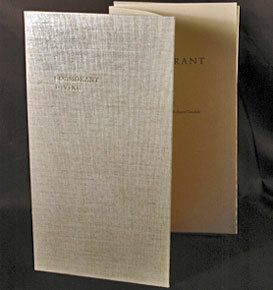 Front cover bound in woven Japanese grass paper. Five rare Junacae in Maine are the subject of this Threatened and Endangered Species book (Alpine rush; Slender rush; Vassey rush; Northern wood rush; Spiked wood-rush). 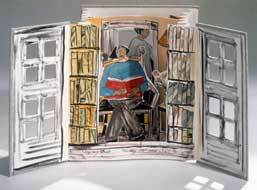 The pale ink on paper imitates the color and value of the cast shadows produced by he cutaways. Portland, Maine: Rebecca Goodale, 2003. Edition of 5. 9.5 x 12 x 1"; 13 leaves. Handcolored silkscreen prints on handmade paper (including pastedowns). Accordion construction. Green silk cloth-covered boards with illustrated handmade paper on front board. In matching green cloth-covered slipcase. Goodale uses the accordion book structure for bringing attention to these seven ferns on Maine's Threatened & Endangered list. She lists the individual species' names under the name of the genus Woodsia. 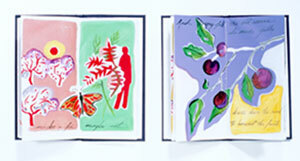 Her vigorous painting strokes and bold design seem to bring the page alive with ferns. Portland, Maine: Rebecca Goodale, 2002. Edition of 10. 8.5 x 8.5" with compound binding. Mixed media prints with hand lettering. 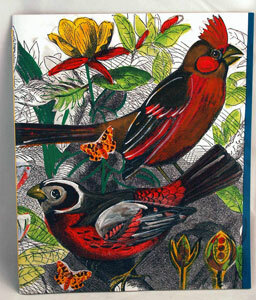 Another of Goodale's books in the Threatened & Endangered series. Each in this series uses different structures and approaches to convey information with text and image. In this book Goodale used Japanese grass paper to cover the boards. 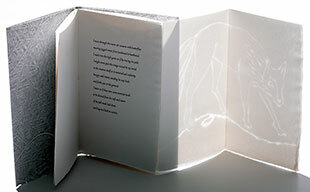 Using this material allows the reader to have a tactile experience as well as a visual one with the subject of the book. Portland, Maine: Rebecca Goodale, 2002. Edition of 5. 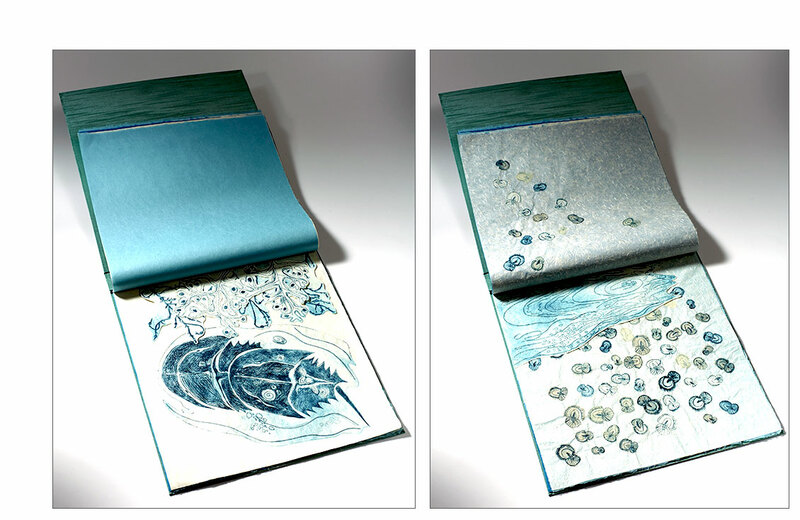 11.5 x 7.25 x 1"; 5 two-page spreads. 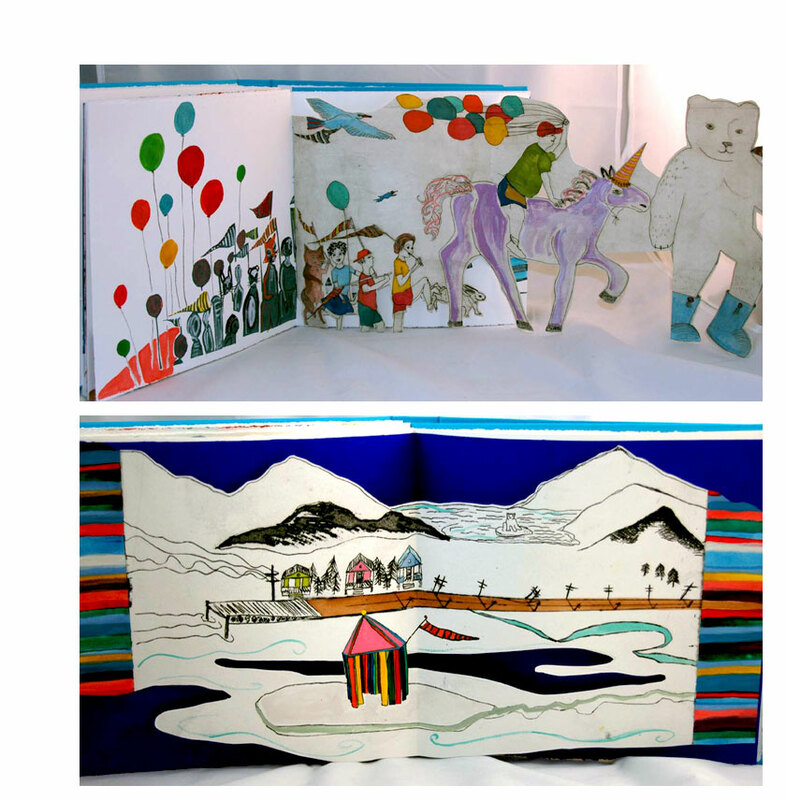 Star carousel book construction. Handcolored silkscreen prints. 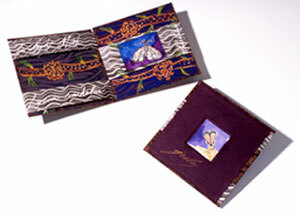 Bound in purple silk cloth with tipped on illustration. Rebecca Goodale: "This book is a seasonal narrative about Maine's last grassland which is managed by controlled burnings to protect grassland dependent species such as the purple wildflower called Northern Blazing Star." 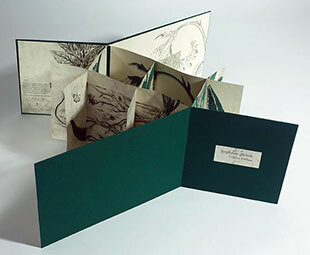 Linda J. Docherty, Catalog of the Exhibition, Catalog of the Exhibition: Threatened and Endangered: Artists' Books Created by Rebecca Goodale, 2004: "Because human encroachment on nature more often takes place incrementally, the damage may be done before the consequences are clear. Goodale's Northern Blazing Star anticipates a future in which species survival depends on artificial recreation of natural patterns. This star book focuses on Maine's last grassland, the Kennebunk Plains, home to the grasshopper sparrow, upland sandpiper, black racer, and Northern blazing star. The latter, a rare plant pollinated by yellow butterflies, depends on fire to preserve the character of its habitat. Under normal conditions, lightning would kindle the necessary fire, but the grassland's shrunken size has made nature an unreliable source. Controlled burning now takes place here in three-year cycles, managed by humans in yellow fireproof suits that aptly match the butterflies. Goodale presents a colorful seasonal narrative of conservation and also compensation for what we have done to nature." Portland, Maine: Rebecca Goodale, 2001. Edition of 10. 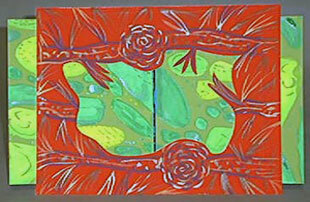 5 x 8.5" banner book with hand colored silkscreen prints and collage. Goodale uses the banner book structure for bringing attention to this plant that is on Maine's Threatened & Endangered list. She lists the individual species' names alphabetically under the name of the genus Carex. To bring the plant alive on the page she uses vigorous calligraphic strokes and bold design. Portland, Maine: Rebecca Goodale, 2005. Edition of 10. 7.25 x 8.5"; 14 unnumbered pages. Accordion structure with end pages pasted in. Handcolored gelatin prints. Bound in cyperaceae papers. Cyperaceae is a family of monocot flowering plants known as sedges, which superficially resemble grasses or rushes. 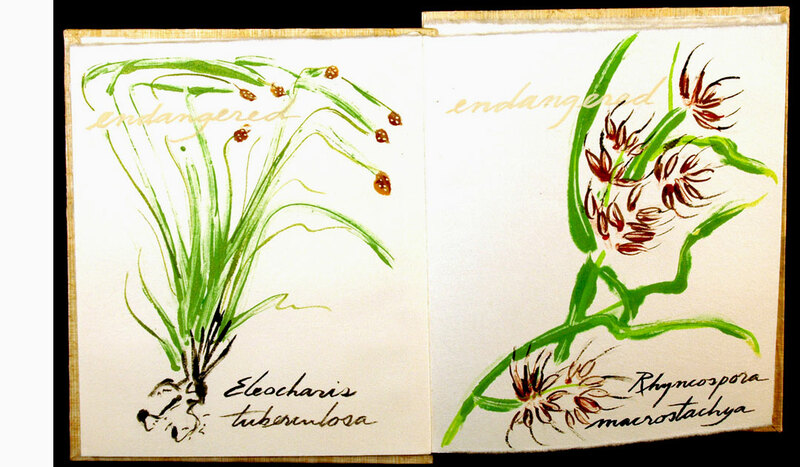 Some members of family Cyperaceae are on Maine's threatened and endangered list, including those illustrated in this book: eleocharis quingueflora; rhyncospora capillaceae; scirpus pendulus; scirpus longii; eleocharis tuberculosa; rhynchospora macrostachya; cyperus erythrorhizos; lipocarpha micrantha; and finkristylis antumnalis. Portland, Maine: Rebecca Goodale, 2009. Edition of 6. 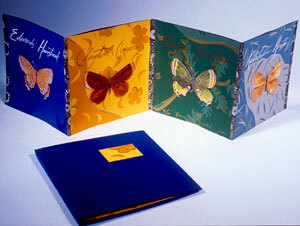 5.5 x 5.5 x 3.25" cloth-covered box holds a pamphlet and interior lid that can be lifted to display a string assembly on which hang 5 butterfly cutouts (printed on a Gocco printer). The outer box has an interior notch for the interior lid to rest upon. Five cotton strings attach to underside of interior lid and bottom of the box. A cotton loop on top of interior lid lifts the butterfly display. Laid in on top of the interior lid a 5 x 5" hand-stitched two-leaf title and colophon pamphlet with text handwritten in ink. 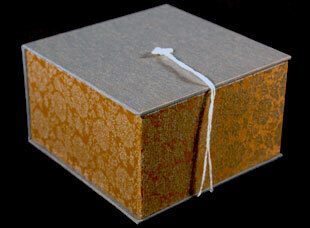 The outer cloth-covered box, a drop lid clamshell box, has a cotton thread and bone closure. Rebecca Goodale: "Sleepy Duskywing was added to Maine's threatened species list in 2007. It is a small brown butterfly. 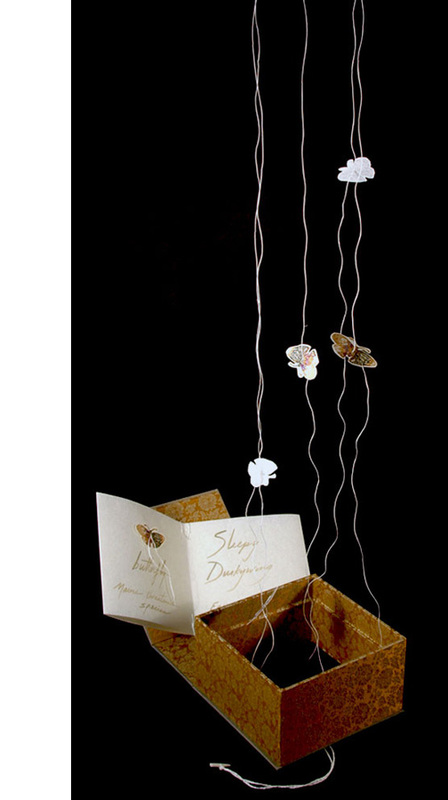 "After opening the box and pulling the string upward five of the butterflies float up out of the box. With a string from the ceiling the loop on the interior lid can be tethered in place for display." Colby Maine Butterfly Checklist: "Five of the 114 species are believed extirpated from Maine and ten have been listed as state endangered or special concern by Maine Department of Inland Fisheries and Wildlife." Sleepy Dusky wing is one of those in the endangered list. 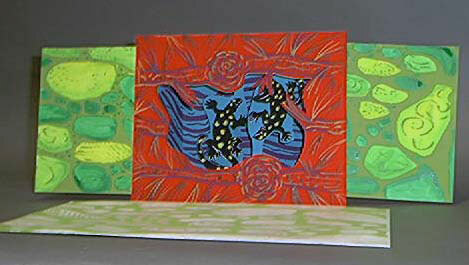 9 x 8.5" hand-colored prints with collage in magic wallet binding with wraparound case. This book focuses on two threatened Maine moths that share a common habitat but mature in different months. Goodale uses a magic wallet form which unites the twilight moth, April, and zanclognatha, July, in a pitch pine / scrub oak barren setting. Using this format restricts the viewer to see both moths simultaneously but these two species are adults in different seasons so one would not see them in the same view. 5.5 x 11" with hand colored silkscreen prints. Two section binding with French folds and Japanese lace paper. Linda J. Docherty, exhibition catalog, 2004: "Goodale also uses words to place threatened and endangered species in relationship to other living things. In Beach Plum ... she describes a community of species that share a protected natural area, Beach Plum Farm, along the coast of Maine. Complementary colors - red and green, yellow and purple - visually reinforce this verbal image of a diverse yet balanced natural harmony. The final line alludes to the recurring cycle of the seasons and also to the imminence of change. When the 'old women who still make jelly' no longer come to harvest the beach plums, another tradition uniting humans and nature will be gone." 6 x 4.25 x 1.5" An accordion book using mixed media of archival ink jet prints and ink on paper. Fifteen birds' eggs are arranged by size. Each cutout is the actual size of the egg and the egg patterns are typical for that species. While generally in Goodale's Threatened and Endangered Species documents those that are disappearing this book points the reader to think of continuation and hope with the promise of new life under the delicate shell. 11 x 16.5" with three section compound binding. 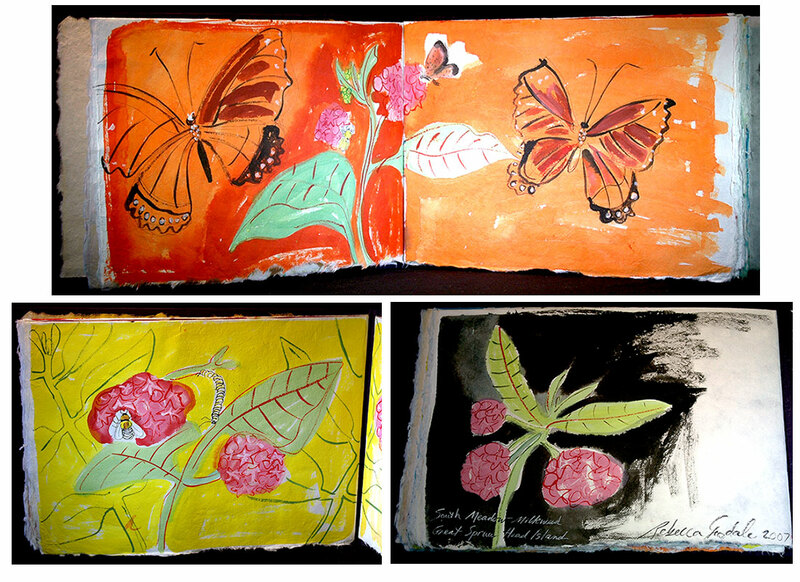 Hand colored silk-screen prints with collage. 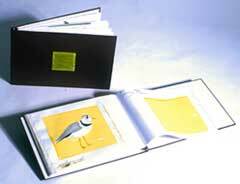 This book's pages are composed of portraits of the fifteen birds listed by the state of Maine as Threatened or Endangered. 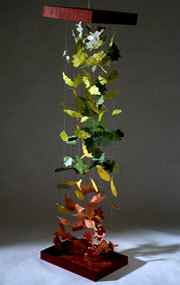 9.625 x 9.5 x .75"; 4 leaves. Silkscreen printed accordion onto which are tipped handcut inkjet-printed butterflies. Clothbound portfolio case closed with an elastic band. 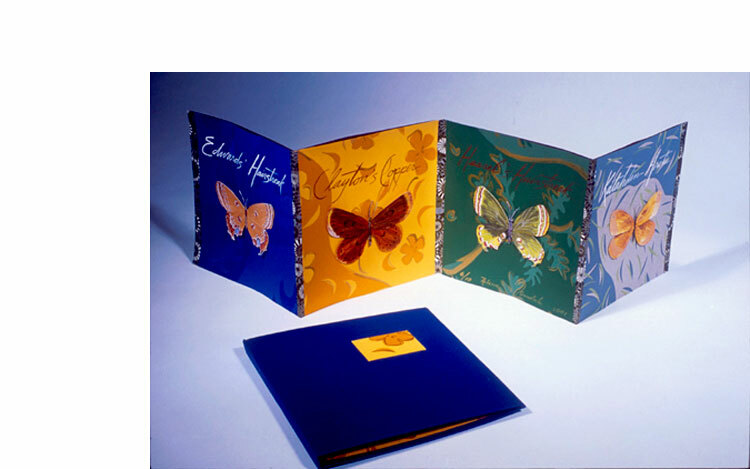 Linda J. Docherty, Catalog of the Exhibition: Threatened and Endangered: Artists' Books Created by Rebecca Goodale, 2004: "Four Maine Butterflies illuminates the fragile beauty of the natural world. It invites contemplations of differences among insects that appear, at first glance, similar. Goodale shows the intricate silhouettes and subtle markings that distinguish Edwards' hairstrea, Clayton's copper, hessel's hairstreak, and Katahdin Arctic. 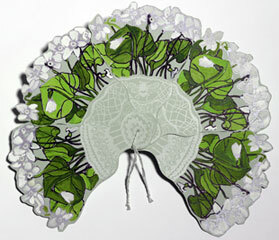 The butterfly forms are cut out and placed on decorative backgrounds inspired by their individual host plants. In the history of art, the butterfly symbolizes resurrection, and Goodale captures this hopeful quality. The insects pop up and hover over the pages, vibrating with life despite their endangered status." 3 x 2.75"; miniature accordion with 6 panels. Handcolored dry point plates. Cloth bound with hand stitching on front board. 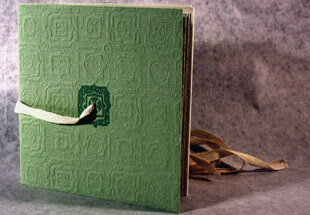 Laid in paper wraparound with matching hand-stitched snake on spine. In cloth-covered slipcase. Signed and numbered by the artist. Rebecca Goodale: "The Ribbon Snake has been added to the Special Concern list in the state of Maine. Thamnophis sauritus is a smaller, more delicate snake than the garter snake." 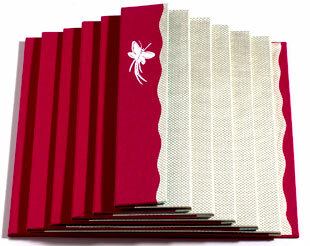 19 x 12", two section french fold cloth bound book with hand colored silkscreen prints. To capture this animal listed on Maine's Threatened and Endangered Species list, Goodale visited the zoo where there were three little Lynx kittens. To be sure she captured their actual size on the pages she made puppets. 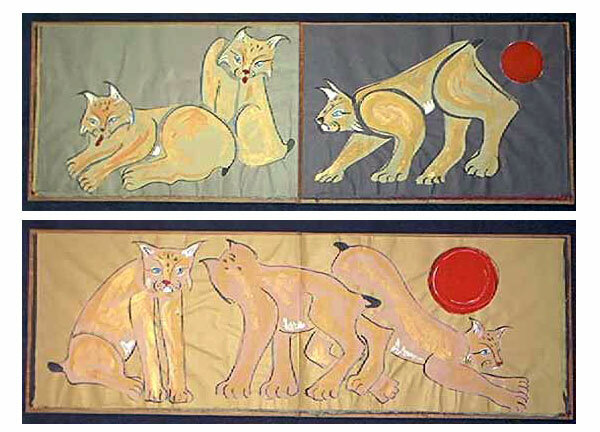 From these she created "stencils" of the kittens in different playful positions. Docherty says in "Invitation to Wonder" that "Lynx, shows three big-pawed kittens playing insouciantly. Such signs of regeneration co-exist painfully with references to the "threatened" and endangered" statuses that permeate Goodale's imagery. Together they suggest that it is late, but perhaps not yet too late, to intervene on behalf of species that are doing what they can to survive." Portland, Maine: Rebecca Goodale, 2005. Edition of 8. Four inch magic cube with hand colored silkscreen prints which are mounted on cherry blocks. Housed in cloth bound box. 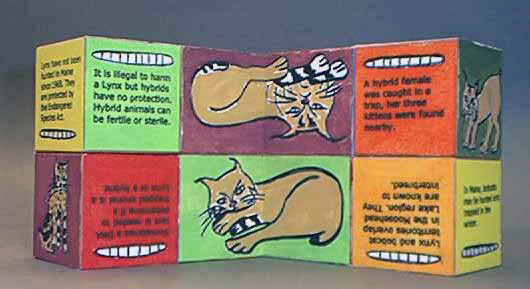 This shifting group of hinged blocks shows bobcat, lynx, and hybrids while the text explains how their overlapping territory has led to interspecies mating. Another in Goodale's Threatened & Endangered series. Portland, Maine: Rebecca Goodale, 2007. Edition of 8. 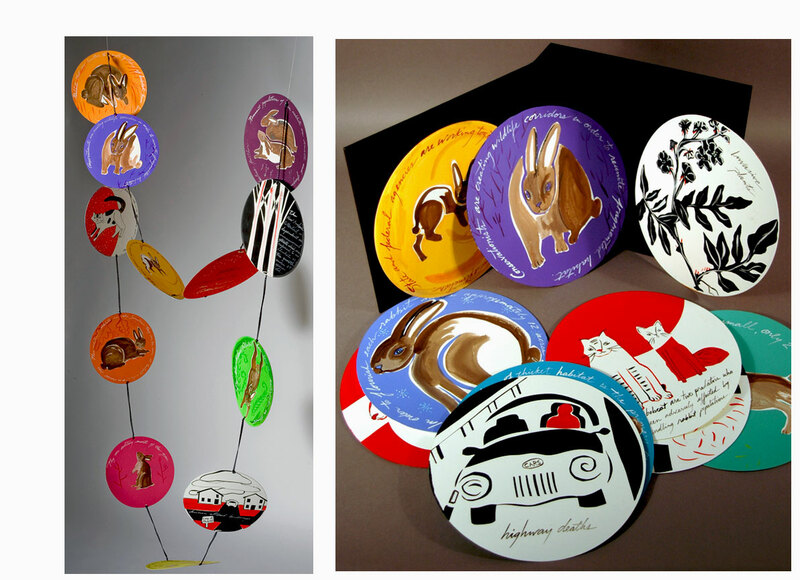 9" diameter paper discs printed on both sides; 12 unbound leaves. Housed in 10 x 10 x 2" black cloth-covered box. The latest in Goodale's Threatened and Endangered Species series concerns the New England Cottontail. In 2007, the state of Maine added the New England Cottontail to its Endangered Species List. Goodale lists loss of contiguous habitat, highway deaths, and pollution as three major reasons for their decline. 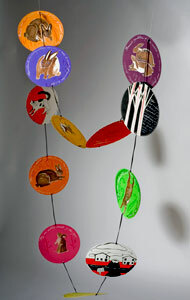 Rebecca Goodale: "It is a circle book, a little like an Alexander Calder mobile, discs that are printed 2 sided with imagery about a rare rabbit and all of its struggles with the human altered environment. 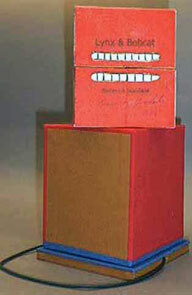 This piece will be in an exhibit at the Portland (ME) Museum of Art this spring [of 2008]." Portland, Maine: Rebecca Goodale, 2014. Edition of 3. 18.5 x 20.5"; 11 leaves. Drypoints on Japanese paper. Chine collé. Bound in cloth-covered boards. Signed and numbered by the artist. Rebecca Goodale: "Some prints cut out and attached on top of others to create illusion of wading at the edge of the sea and shore. There is also a two-page spread of chine collé larvae. 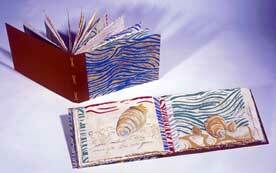 This large clothbound book is read vertically, the pages moving up and down like the surf." Part of Goodale's extensive "Threatened and Endangered Species" series. Casco Bay Estuary: "Horseshoe crab spawning surveys were initiated in Maine in 2001 in response to anecdotal reports that populations were declining. This project involves collaboration among the Maine Department of Marine Resources, Bar Mills Ecological, Maine Coastal Program, and many other organizations to establish quantitative baseline population data to determine whether horseshoe crab populations are stable or declining. Approximately 50-70 volunteers collect data annually at sites ranging from Casco Bay to Frenchman's Bay. Volunteers measure water temperature and survey the number, clustering and location of horseshoe crabs along a transect during predicted dates of peak spawning activity typically associated with the new moon and full moon lunar phases of late May and June." Portland, Maine: Rebecca Goodale, 2009. Edition of 5. 12 x 15.5"; 43 unnumbered pages, many of which fold out from the main text block. Block printed with rubber stamped letters. Cloth bound. Rebecca Goodale: "This book unfolds to reveal a vernal pool with the four indicator species and a poem about mating season." An indicator species is often the most sensitive species in the region and acts as a warning to monitoring biologists. The indicator species of the vernal Maine pool are fairy shrimp, blue salamanders and yellow spotted salamanders, and wood frogs. Portland, Maine: Rebecca Goodale, 2004. Edition of 5. 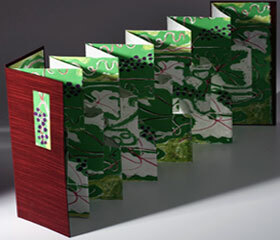 A dos-a-dos binding with cut paper and ink mounted on paste papers. During the mating season the Least Tern male will woo his mate with his fishing abilities. The female is given a fish each time they mate. The male spends his days perpetually fishing and mating. 12 x 8". Hand colored silkscreen prints on handmade paper. 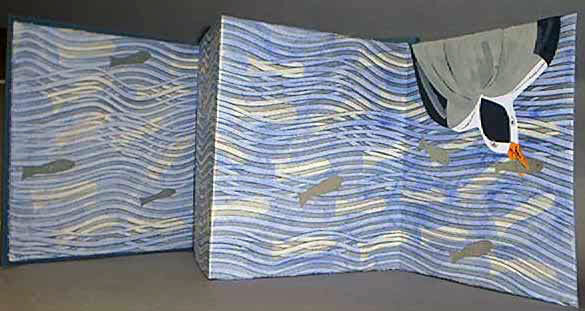 Two section binding in flat backed case. Comments from Docherty in "Invitation to Wonder": "Goodale focuses on species behavior that is ingenious if not intentional. When their population density dwindles, some of these mollusks become hermaphrodites, thereby maintaining their reproductive capability. The larvae live as parasites on unknown host fish, adding further mystery to their survival. " 12.5" closed; 19.5" extended theater book in 12.5 x 9" tyvek envelope. Slider illustrations hand colored silkscreen prints. Vernal pools are small wet areas in the springtime. In Maine, they are the breeding habitat for four species. One of these is the blue salamander. By the time summer arrives the eggs have hatched and the pools have evaporated. This lovely artist rendering of the pools slides away to reveal the mating salamanders. Another in the Threatened and Endangered series. Goodale originally editioned this book in 2002 but it was so popular that she has editioned a second one with brighter colors. 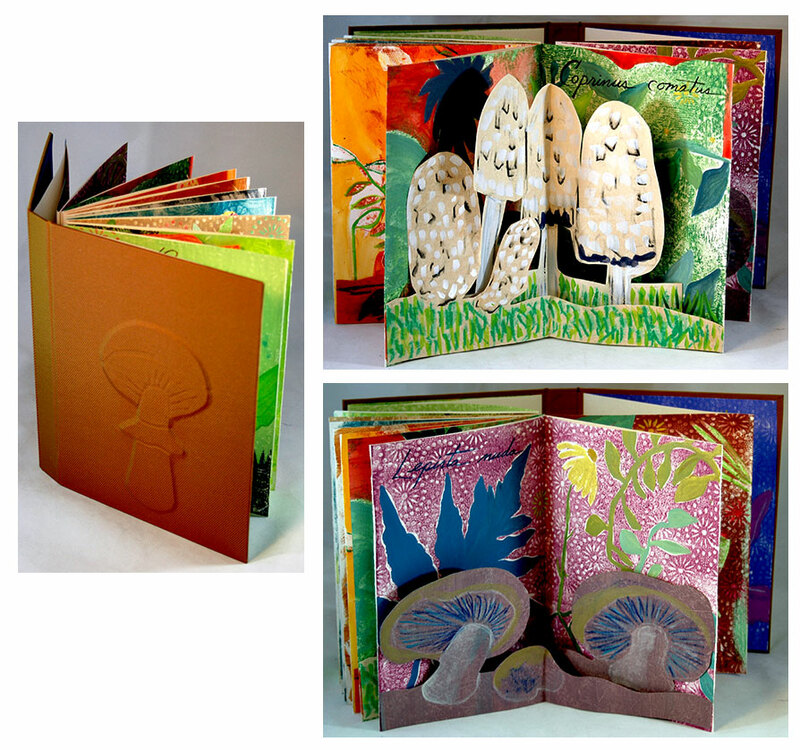 Goodale's primary body of work is a series of artist's books and prints about the plants and animals currently listed as threatened or endangered by the State of Maine. Research for that project brought Goodale into contact with many other species in Maine's natural bounty. Portland, Maine: Rebecca Goodale, 2016. Edition of 5. 7 x 9.25"; 20 pages. Pop-ups. Flutter book construction. Monotype silkscreen prints and monotype gelatin plate prints. Handcut and handcolored with ink and colored pencil. Handwritten text. 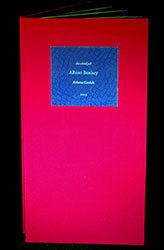 Cloth bound flat-backed case with an onlay beneath the cloth on the front cover. Rebecca Goodale: "After years of walking in the woods, studying, and eating mushrooms, this is my first book about some of the most delicious mushrooms in my town." Portland, Maine: Rebecca Goodale, 2013. Edition of 3. 16 x 14.75"; six double page pop-outs. Paper cutting. Silk screen. Bound in cloth-covered boards. Signed and numbered by the artist. Although the Ilex Laevigata does not fall in Maine's threatened or endangered categories, it does have a state status of special concern. That is, while the number of occurrences are low (between 20 to 100 in the state) the habitat seems secure so it is considered rare but not endangered. Maine Department of Agriculture, Conservation, and Forestry: "Smooth winterberry holly is a deciduous shrub which resembles the closely related common winterberry (Ilex verticillata) found throughout Maine. It grows up to 4 m high, with oval leaves which are finely toothed along the edges and shiny on their upper surface (the common winterberry has dull leaves). There are separate male and female flowers, usually on separate plants, in the leaf axils. The staminate flowers occur singly or two together and are borne on long stalks, while the pistillate flowers are solitary and on shorter stalks. The ovule-bearing carpellate flowers develop into small, red berries. "This plant is restricted statewide to southern Maine. Some populations are vulnerable to conversion of their habitat to residential or commercial use; other populations, located farther within larger wetlands, are more secure." 13.75 x 12.5 x 3.5"; 24 pages. Handcolored silkscreen prints with paste patterns. Letterpress printed text. Wedding cake binding. Housed in three quarter clamshell case. Rebecca Goodale: "This is a book I have been working on since 2010. 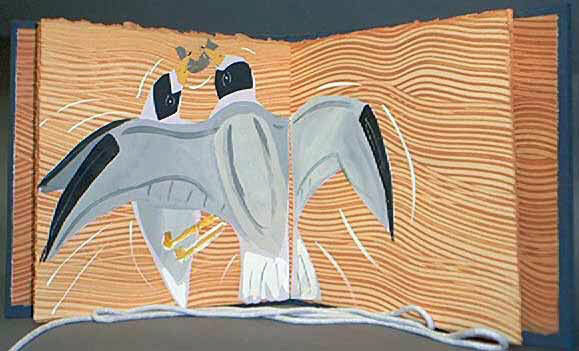 In its 11 chapters it conjures up memories of white animals (and plants). Although this book is not specifically about flora and fauna protected by the Endangered Species Act, the book brings to mind how human impact has created islands of territory that limit DNA pools and lead to such anomalies as albinism, leucism, melanism, and piebalds. In fact two piebald white tail deer in our neighborhood were the start of my poetic remembrance in chapter 5. So, although there isn't a specifically labeled threatened or endangered species in this collection, I feel I am still working from the same point of view with this volume. "The binding is referred to as a compound dos-à-dos or Wedding Cake. At first it may seem clumsy to manipulate, but after a turn through once or twice you will feel at ease. It also displays nicely carefully opened flat to reveal the hot side (lobsters, porcupine, birds, whale, rhinos) and it stands well on the cool side (mayflies, squirrels, poem, unicorn, and moose) – the raccoons do not open while standing." Portland, Maine: Rebecca Goodale, 2013. Edition of 8. 11.5 x 6.25"; 10 pages. Handcolored silkscreen prints. Letterpress printed text. Accordion structure. Bound in cloth boards with paper title label on front board. Signed and numbered by the artist. An abridged version of Goodale's original edition of "Albino Bestiary." This version is a simple accordion structure. 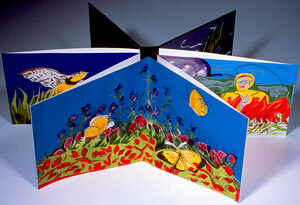 Goodale's poetic remembrances are printed on the middle four pages on a vibrant blue/purple background. Screenprinted images bookend the text. I remember a white doe with a large brown spot on her side. I remember a white fawn with a brown head. Portland, Maine: Rebecca Goodale, 2012. Edition of 3. 6 x 6"; 18 unnumbered pages. 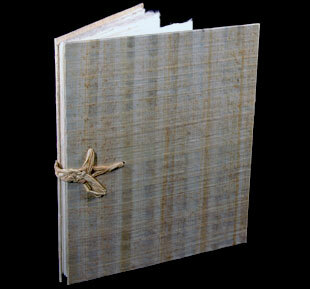 Handmade paper folded into 5 French-folded signatures sewn onto two straps. Handcolored collagraphs and velvet flowers tell the wordless story. Banded with button and thread closure. Rebecca Goodale has been documenting the extinct and endangered flora and fauna of Maine since 1999. Her books in this area, as Nicholas Schroeder said in a review of her exhibition Lullaby, "vivify, celebrate, and elaborate them, often with poetic flourishes, rich metaphor, and abundance of color. Their surfaces mirror her subjects' habitats, and the rhythm of their bindings borrows from their intricate and animate patterns." 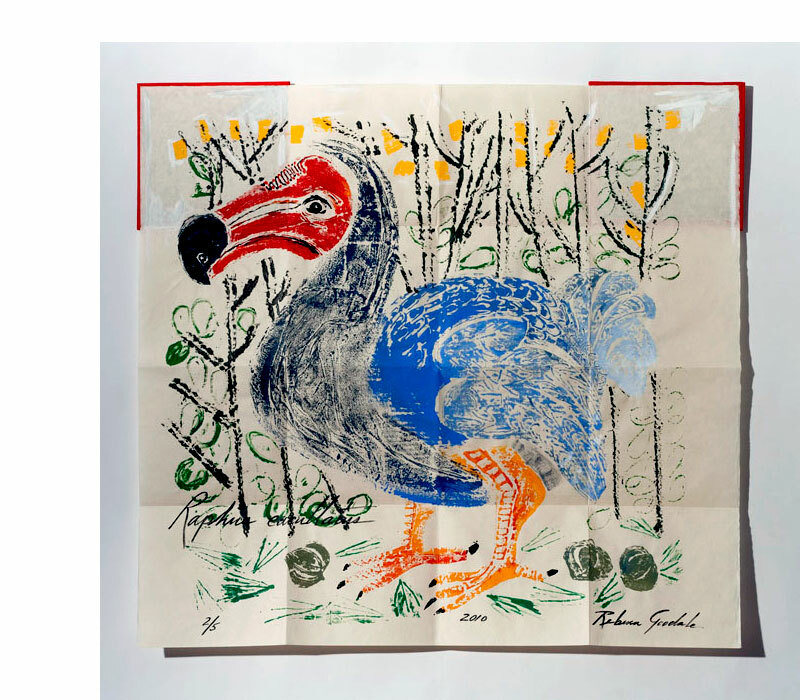 Once in a while she diverts from the specific theme of extinct and endangered to produce a playful book still with the theme of flora and fauna. Bird, String, Cricket is such a book. 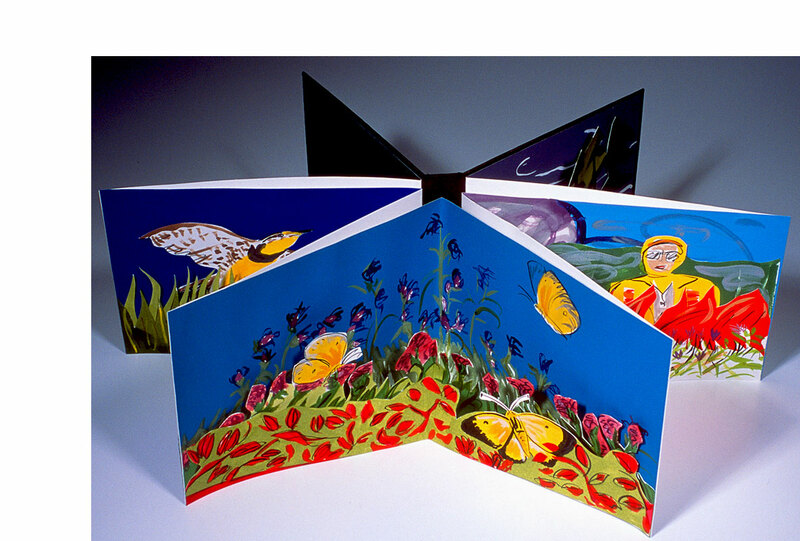 It is a playful book with bright colors and velvet flowers — a bird, a string, and a cricket. Portland, Maine: Rebecca Goodale, 2010. Edition of 15. 9.625 x 15.5"; 22 pages. Letterpress printed. Hand colored silkscreen prints. 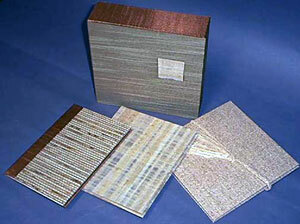 Accordion fold with one end bound into boards via the pastedown. Bound in green cloth with silk screen illustration on front board. 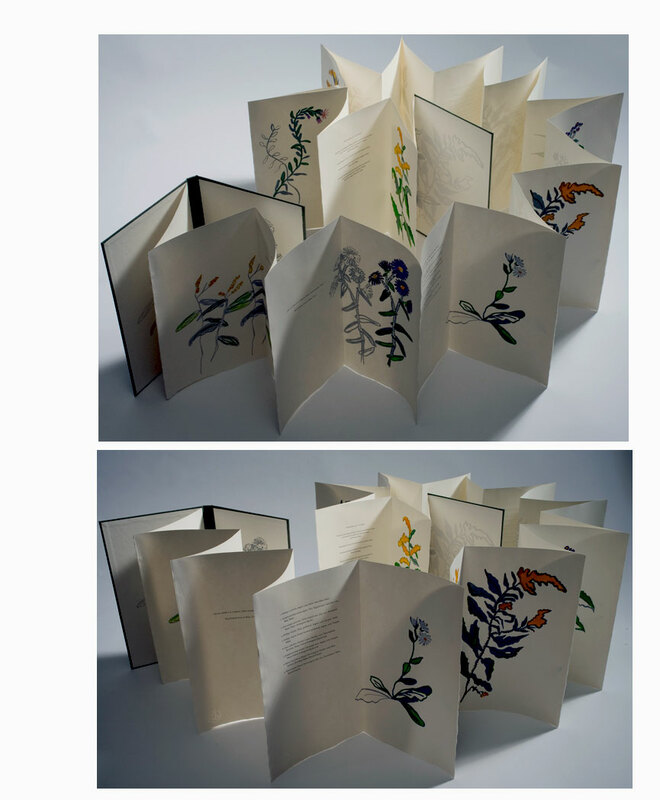 Rebecca Goodale: "[My poem, "Asters and Goldenrods"] explores the intersection of my project with the botanical drawings of Kate Furbish." The project Goodale refers to is her Threatened and Endangered series, documenting and memorializing every threatened and endangered plant and animal species in her home state of Maine. Research for that project brought Goodale into intimate contact with a woman of an earlier time who also passionately recorded and memorialized Maine's natural bounty. 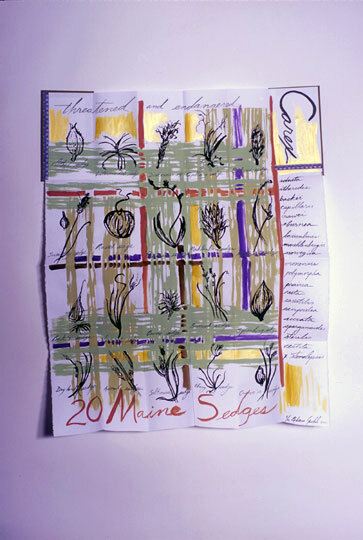 Goodale's poem is accompanied by her drawings of 17 asters and goldenrods. A list with species name plus date and place of original drawing and sighting is included. Bowdoin College, Special Collections: "Kate Furbish (1834-1931) was born Catherine in Exeter, New Hampshire, on May 19, 1834, to Benjamin and Mary Lane Furbish. When she was barely a year of age, the family relocated to Brunswick, Maine, where she developed a passionate interest for wildflowers. Like many young women of her time, Kate pursued a genteel education, which included painting and the study of French literature; she even spent a year in Paris perfecting her painting. In 1860, however, a serious interest for science gripped Furbish after she attended a series of botany lectures in Boston by George L. Goodale, later a professor of botany at Harvard. "The bulk of Furbish's life's work – collecting, classifying, and drawing the flora of Maine – was done between 1870 and 1908. By 1880 she had earned respect among well-known naturalists, including the eminent American botanist Asa Gray. In 1894, Furbish also helped to found the Josselyn Botanical Society of Maine and she served as president in 1911. In 1908, Furbish bequeathed her collection of paintings and drawings to Bowdoin College. She died on December 6, 1931. "Kate Furbish's name gained fame in 1976 when the wild snapdragon, named the Furbish lousewort, was rediscovered after having been believed to be extinct. This discovery helped stall and eventually stop the building of the Dickey-Lincoln dam and reservoir on the St. John's River, which would have flooded 88,000 acres of northern Maine forests." 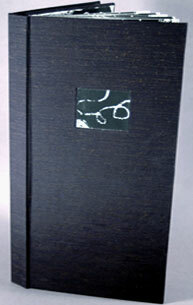 3.125 x 3.125 x 2.125" slipcase containing six 2.75 x 2.75" miniatures. Each employs a different book structure. 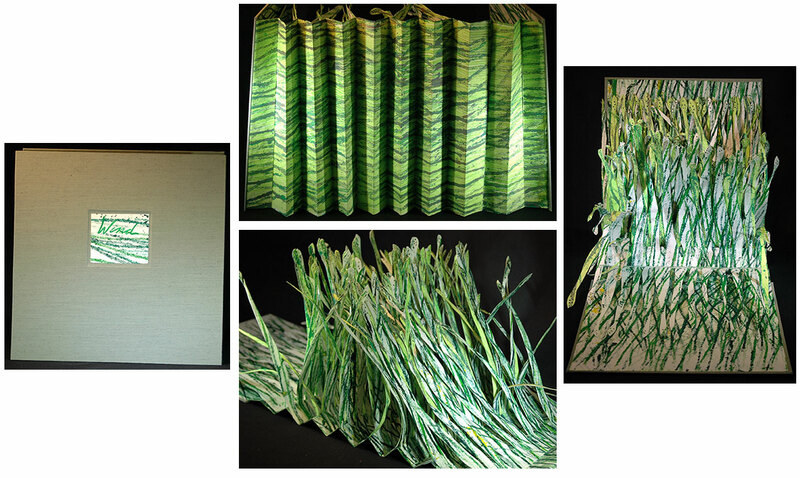 Bound using floral ivory patterned cloth front board with solid green cloth spine and back board. Each book denotes the common plant name as well its scientific name. Another bookwork in Goodale’s Threatened and Endangered series (in which she plans to cover all the threatened and endangered species in Maine). 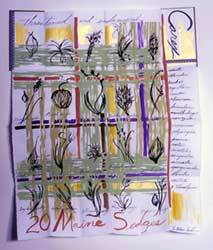 Alpine Plants was inspired by Goodale's visit to Mount Katahdin during the summer of 2005. 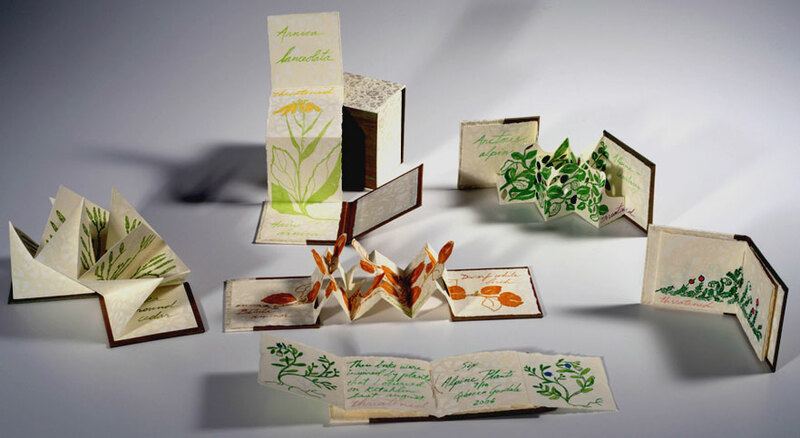 Not surprisingly, this set of six miniature books spotlights Alpine plants. Five – bearberry, blueberry, moss plant, sitka ground cedar, and hairy arnica -- are in the threatened category: Dwarf white birch is in the endangered category. Rebecca Goodale on her Threatened and Endangered project: "My research is multi-layered. I being by talking to local naturalists, who are incredibly generous with their time and knowledge. I travel to labs and libraries in order to draw specimens. I walk off into the woods, grassland, and tidal riverbeds to see Maine's rare species in their natural habitats. When I go to a particular place to see a specific plant or animal, I often find myself scribbling notes or making drawings about something else I hadn't been looking for. In spite of all of my research, it is not my intention to become a scientific illustrator; instead, I want to inspire sensitivity for these rare species by using my background in book arts and textile design to interpret what I see with color, pattern, rhythm, and transition." 18.5 x 25.5"; 18 unnumbered leaves. Silkscreen prints, hand cut. Single section book. Bound in black cloth with cutout of lily tipped on front board. Rebecca Goodale:"Cathance River is a local, tidal, freshwater river. This is a favorite kayaking spot of mine because this peculiar and rare habitat is home to some unusual plants, including nuphar advena, a rigid water lily." Goodale's work for much of the first decade of this century has focused on her Threatened and Endangered Series, documenting every threatened and endangered species, both flora and fauna, in Maine. Although the nuphar advena does not yet fall in this category, it is on the watch list. Portland, Maine: Muse Press, 1990. Edition of 45. 6.25 x 12"; 14 unnumbered pages. Accordion structure. Letterpress printed on Nideggen paper from handset Poliphilus and Blado types. Hand-colored tile cuts. Bound in beige cloth over boards with title gold-stamped into front board. Printed and bound by Jeffrey Haste. 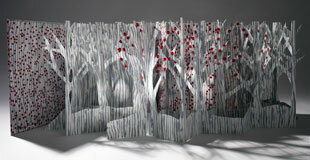 A collaboration between artist Rebecca Goodale and poet Dennis Gilbert. Maine Arts Commission: "Dennis Gilbert is a widely published writer who teaches autobiography and creative writing at the University of Southern Maine. His interest in collaborative work has led to the publication of Cormorant Diving (Muse Press)…. " Portland, Maine: Muse Press, 1989. Edition of 35. 4.25 x 9.5"; 16 unnumbered pages. Accordion structure. Silkscreen and hand colored on Nideggen paper from handset Poliphilus and Blado types. Typography, printing and binding by the poet, Jeffrey Haste. Signed by both artist and poet. 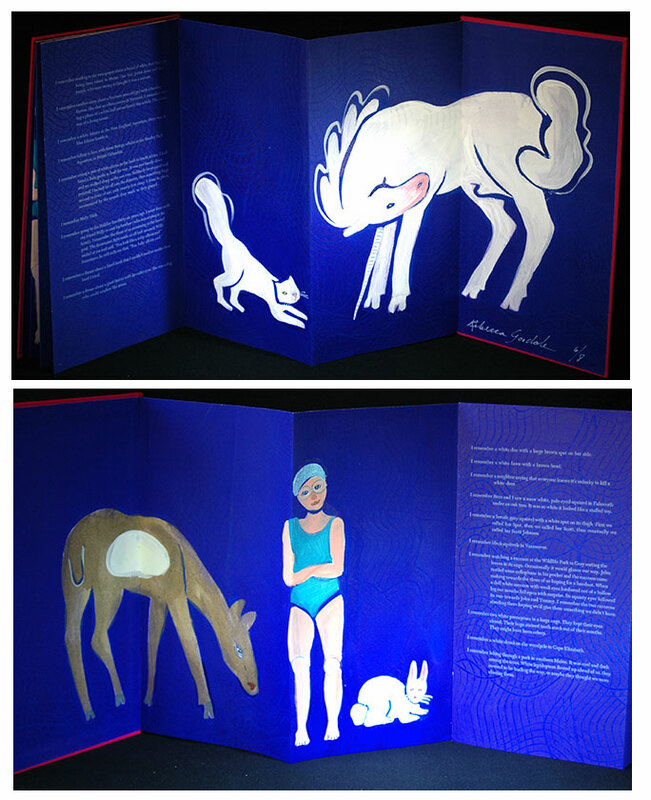 A collaboration of artist Rebecca Goodale and poet-printer-bookmaker Jeffrey Haste. 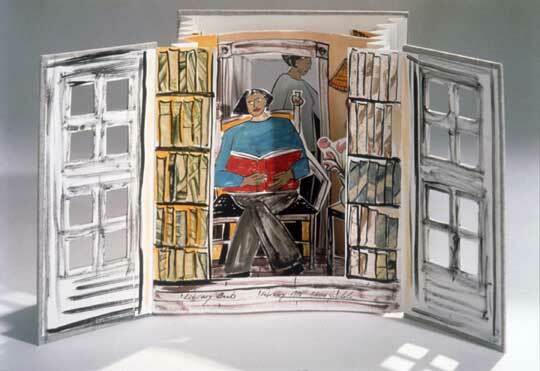 Haste, a graduate of the book arts program at the University of Alabama, has been making books and writing poetry for twenty-five years. Portland, Maine: Rebecca Goodale, 1998. One-of-a-Kind. 10.5 x 11", unique tunnel book using ink and collage on paper. Portland, Maine: Rebecca Goodale, 2015. One-of-a-Kind. Ink on paper scroll. 3" with 1.5" diameter closed, extends to 108". Double-sided. White ink on black paper. Punch circle cutouts. Black and white ribbon accents and closure. Handwritten title. Rebecca Goodale: "I was the one who wrote my mother's obituary. 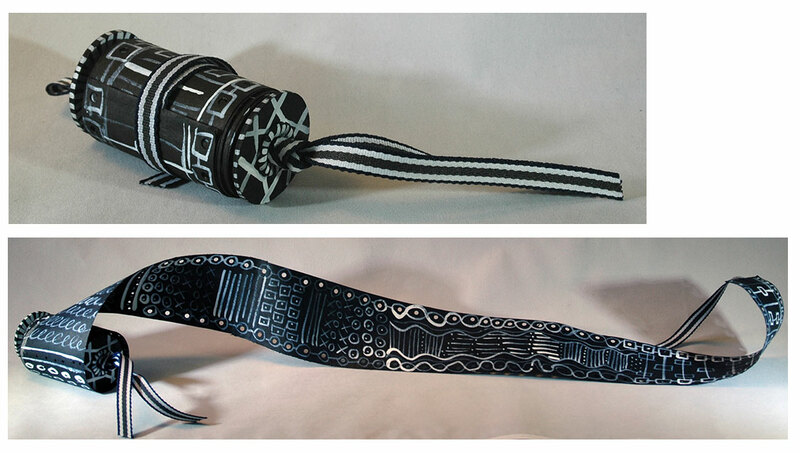 In preparation for that task, I created this long black scroll with patterns of white ink. I imagine it dangling in space and draping into a pile on the floor or surface below. The repetition and rhythm of the marks underscore the daily rituals of being human — cooking, eating, walking, dancing, working, cleaning, laughing, breathing, sleeping, loving." Portland, Maine: Rebecca Goodale, 2009. One-of-a-Kind. 20.5 x 14 x 3" closed; 10.5 x 14 x 96" extended. Silkscreen printed oak leaves attached to a 13 cotton strings, which are in turn attached to the bottom and top of the maroon cloth-covered box in which the work is housed. The Chestnut Oak (quercus prinus) is listed as endangered in Maine's official List of Endangered and Threatened Plants. Lift the cotton loop attached to the lid's exterior and watch streams of leaves rise on 13 strings like flags on a ship's halyards. 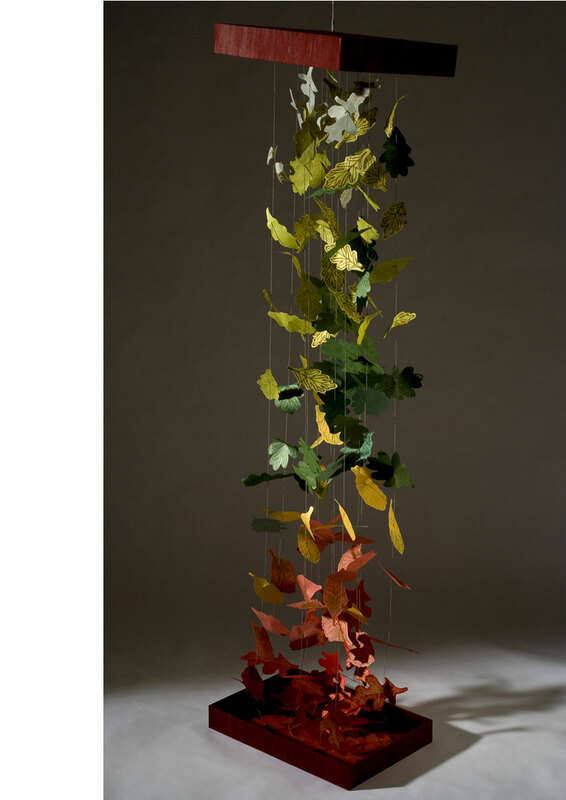 Quite obviously meant for display, the lid can be hung from the cotton loop so that the leaves flutter delicately in the wind. Fully extended this homage to the Chestnut Oak rises to 8 feet. Portland, Maine: Rebecca Goodale, 2007. One-of-a-Kind. 16 x 11.5"; 16 pages. 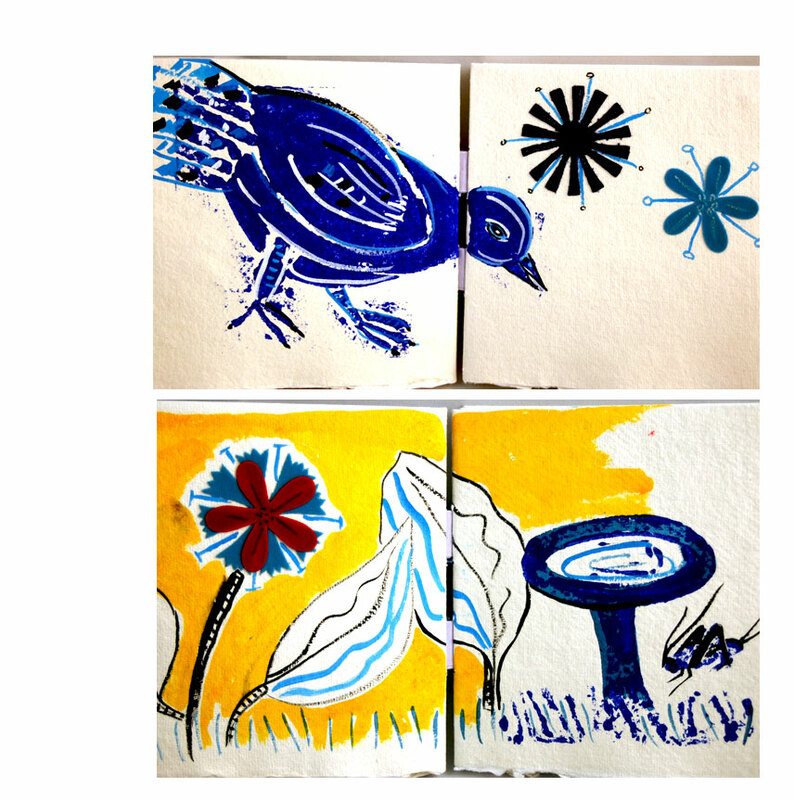 Ink drawings on handmade paper. Two-section sewing on clothbound hollow back case. Signed and dated by the artist. Rebecca Goodale: "My second Artist's Residency on Great Spruce Head Island, Maine, was in mid-July. The milkweed was in full bloom and the noisy insects seduced me into visiting the South Meadow every day where I drew from life and laid out the pages of this book. In the late afternoon I would return to a small screened porch on the west side of the house, get out my brushes and ink to paint the pages. This book is filled with the music and fecundity of summer." 10.25 x 10.25 x 1.5"; 20 pages. Accordion structure extending from front pastedown. Hand-colored etchings and screen prints. Cutouts and pop-ups. Cloth covered boards. 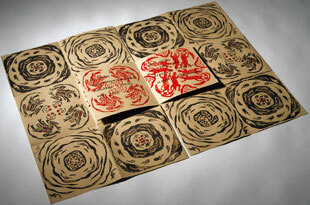 Created in collaboration with Carrie Scanga, Professor of Printmaking at Bowdoin College. 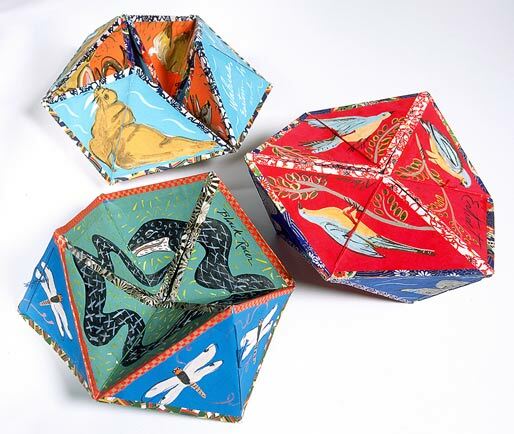 Rebecca Goodale: "I met Carrie Scanga when she arrived in Maine to teach Printmaking at Bowdoin College. 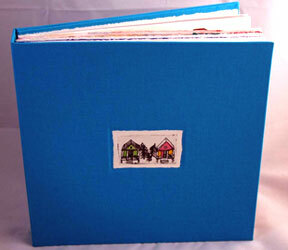 We decided to make a book together using etchings and silkscreen prints. We began by etching into a large plate, sitting side by side working on the same image. Carrie brought her tent and the balloon man and I brought the unicorn and the polar bear. We developed the narrative as we worked. The silkscreens happened after the plates were printed. We hand colored the prints, designed the pop-ups and then the binding. We worked together in our studios for 11 months on and off until the edition was complete." Carrie Scanga: "With a book, you turn pages. Books have pacing. It can’t help but become performative and time based." If whimsicality and color turn you off, so will this book. But if they turn you on, look out.